Indiana University East celebrated the accomplishments of its students during the annual Honors Convocation held April 19. 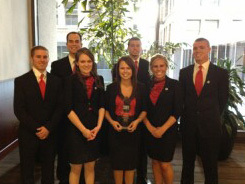 The Indiana University East Students in Free Enterprise (SIFE) team won a regional championship in its league during the SIFE United States Regional Competition Exposition held April 10 in Cincinnati. IU East students on the team are James Healton and Shawna Sparks, both of Centerville, Ind., Ryan Doughty of Richmond, Nick Miller of Winchester, Brittany Hostetler of Camden, Ohio, and Rick McKinney and Megan Winn, both of Eaton, Ohio.